Exotic Aquarium of Detroit has served the Metro Detroit Area for over 50 years providing quality Tropical Fish, Aquariums, and supplies to residents of Southeastern Michigan. We have decided to share some of the History of our store to our visitors on the Internet though pictures from the past. We will be scanning and uploading old photos and images from the past and posting them here on our website so check back often for updates. 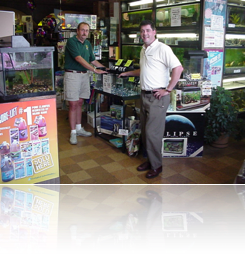 In 2001, Exotic held a 50th Anniversary Celebration with many special events in the store. That summer, many of the companies that manufacture products that we sell gave us unbelievable support with Prizes for our customers and company Reps giving "In Store Demos". We are still grateful for their support and help in making our 50th Anniversary Celebration a very special event. In 2005, Detroit Mayor Kwame Kilpatrick decided to close America's Oldest Public Aquarium, The Belle Isle Aquarium, located on the Scenic Detroit Island Park that shares the same name. Exotic Aquarium partnered with the Friends Of Belle Isle Aquarium in a last minute effort to save this valuable resource but it was too late. The Friends Of Belle Isle Aquarium are still working on reopening this valuable Detroit resource.